zscroll is fairly straightforward to use, with simple flags for options like after-text or before-text, or for padding the display with special content. You can also adjust the speed of output, clip it at a particular length, or set it to use double-width characters. 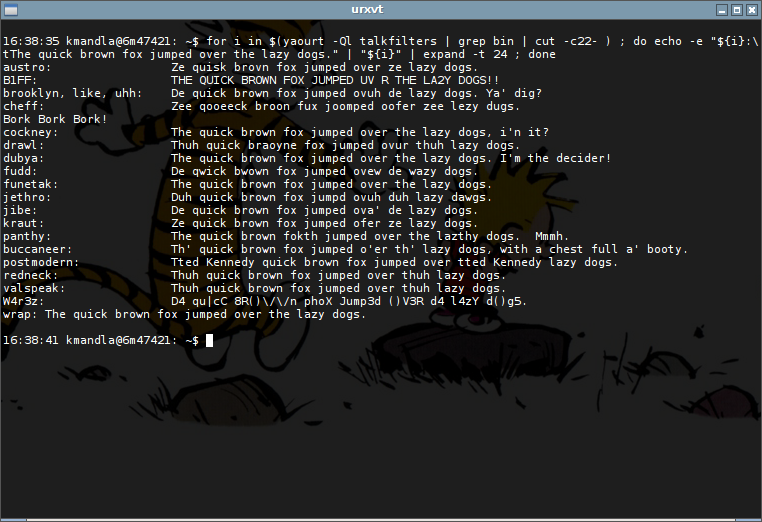 And zscroll allows just about any text to appear, provided you can wrangle it to fit and display as you want. As an example, I yanked the mocp playback status in the image you see above; it’s nothing special, but shows zscroll’s relative flexibility. I don’t see a way to reverse the scrolling effect, which means if you want a left-to-right motion for right-to-left languages, it might not happen. 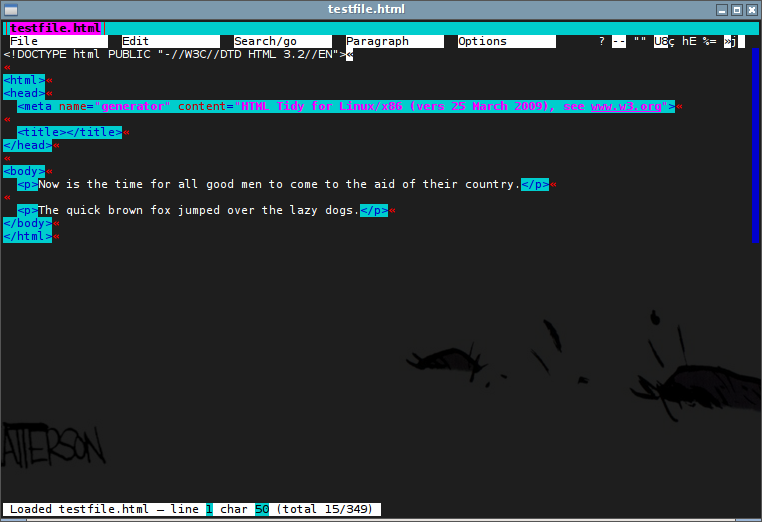 And of course, if you set zscroll to display in a window that’s wider than your target text, nothing moves at all. It would be nice if zscroll could wrap the object text to fill any space. This entry was posted in Linux and tagged animate, scroll, text on 2015/04/11 by K.Mandla. For a second title today, here’s atto. atto is a line editor of extremely minuscule dimensions. The source code takes up only 16K, and the executable is a mere 18K. 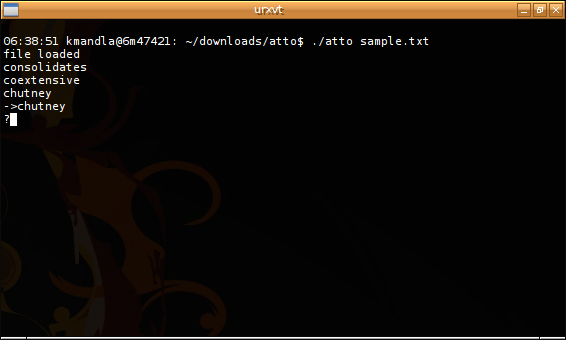 My ancient ps_mem.py script tells me that, without a loaded file, atto is running on 40K, which makes it technically smaller than e3 — and that is saying something. Problem is, as a line editor, it can be quite a tangle to work with. 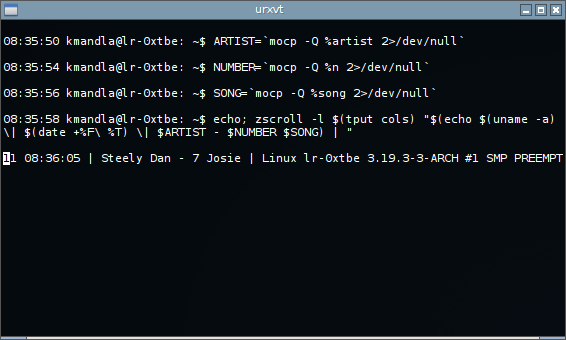 I supposed if you’ve handled ex, which is vi’s line editor counterpart, atto might be easier to learn. But for me, line editors are mostly inscrutable. atto has a help screen that shows all the available keystrokes and their corresponding actions, but I find I’m a bit lost on how to even navigate with atto. I see that pressing SPACE steps through the file line by line for me, and if I press “e” I get an editing prompt, but beyond that, I’m mostly lost. I suppose I should be disappointed or try harder, but to be honest, atto (and line editors on the whole) are mostly curiosities to me. I have tried a few, and even some that are one step up from your normal line editor, but the entire style just doesn’t appeal to me. I cut my teeth on WordStar and the like, and line-by-line editing is just not my style. In any case, I can see the usefulness of extremely small editors such as this, and given its gossamer profile, it has applications in wicked tight situations. But I would probably have to work my way back to the Pentium era to put myself into one of those spots. Not in AUR. Not in Debian. 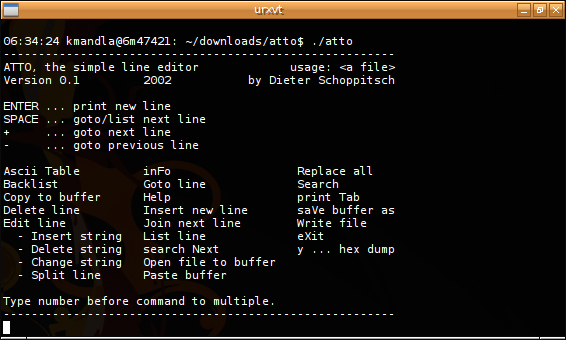 The command to compile atto is on the home page. Enjoy! This entry was posted in Linux and tagged editor, text on 2015/04/07 by K.Mandla. 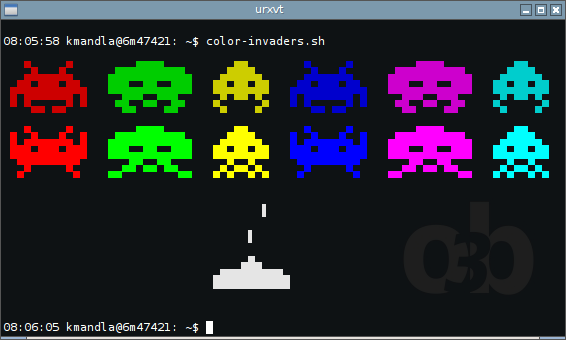 karl sent an orchard of exclamation points (happy ones, that is) on Saturday along with a note about color-invaders.sh, which apparently has its roots on the Crunchbang forums. And there you can see my very bland color scheme, which probably wouldn’t win any exclamation points from karl. Part of karl’s enthusiasm though, was for a website that lets you experiment with colors and returns the codes necessary to implement them. karl didn’t say where that came from or if it was his own invention, but I don’t think it is. I am sure there are other sites that similarly streamline the coding portion of custom shell colors; if there is a better one, feel free to mention it. 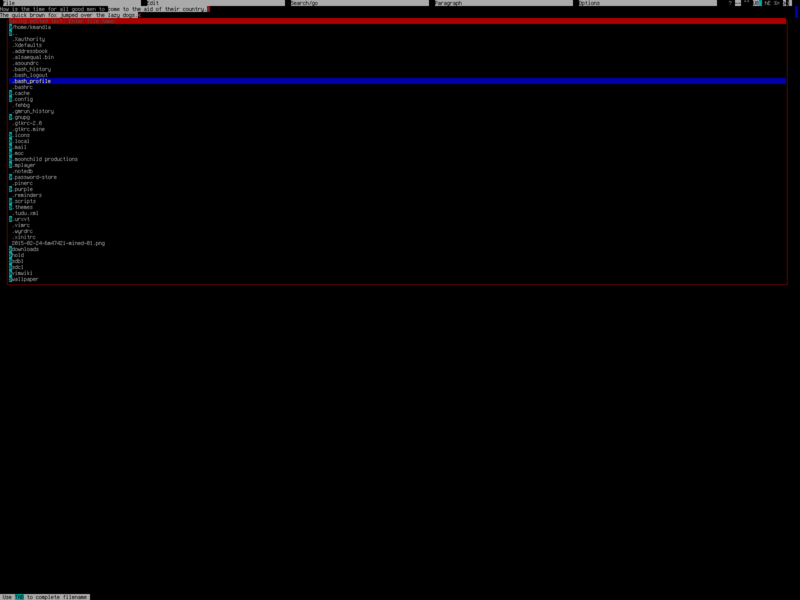 And if you have a script or tool that displays shell colors in a more inventive fashion, pass it along too. I am sure at least one person — mostly likely karl! — would be happy! to hear about them! 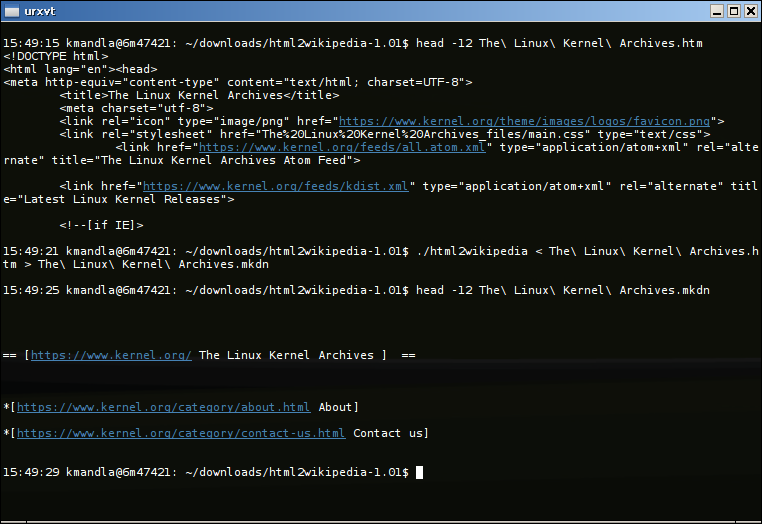 This entry was posted in Linux and tagged color, display, shell, text on 2015/03/02 by K.Mandla. I could swear that I had looked through mined a year or two ago, and found it worthy. But I got an email yesterday from martintxoz saying it wasn’t anywhere on this site, which would be a dire oversight. And now, looking through the Index I find nothing, and both DuckDuckGo and Google agree: I have been remiss. mined is a text editor that comes in a variety of flavors and versions, and one of the reasons I should have visited this long before now is that it goes to great lengths to satisfy weirdos like me. If that isn’t enough for you, I can honestly claim that I’m amazed at the length and breadth of options available to you — all the way down to whether a paragraph end is coded with a non-blank line end, or an empty line. That is considerable detail. Supposedly, mined’s real claim to fame is support for multicode characters or alphabets beyond the stale 26 letters that comprise Western language. If you need access to those glyphs, mined might be something to look into. mined is good stuff. It has just about every feature you could imagine, makes no excuses for pulling in the keystrokes and styles of other popular editors, uses colors and a menu approach, and even has features that will appeal to specific groups of users. It’s well arranged, well thought-out and has a clean visual appearance. This entry was posted in Linux and tagged editor, text on 2015/02/24 by K.Mandla.